Jennifer Douglas Literary Publicist: Bear Has a Story to Tell - Philip C. Stead, Illustrated by Erin E. Stead. 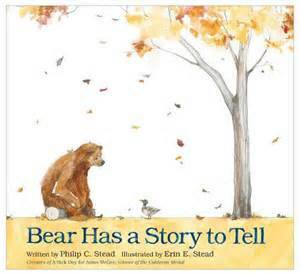 Bear Has a Story to Tell - Philip C. Stead, Illustrated by Erin E. Stead. A story of friendship, love,compassion, helping your friends, patience and a great big cuddly bear, Bear Has a Story to Tell by Philip C. Stead is heartwarming and inviting. The illustration by Erin E Stead adds to the warm fuzzy feeling, enhancing the character of an adorable bear that you just want to pick from the pages and snuggle up with. My 5 year old snuggled into me as we traveled with Bear on his journey to tell someone his story. With winter approaching Bear is getting sleepy but he has a story to tell. All the animals are busy preparing for the winter season, Mouse has seeds to gather so Bear helps, Duck is getting ready to fly south so Bear tells him he will miss him, Frog is looking for a warm place to sleep so Bear digs a frog-sized hole between two evergreens, Mole was already asleep so Bear wishes him a good night. Many months pass and Bear awakes from his long winter nap. Again Bear is thoughtful toward others. He brings Mouse an acorn, welcomes Duck home and shows her a shady mud puddle he has found, he places Frog in the sunshine till he is warm and awake and all the friends sit together and wait for Mole to awake. It is then that Bear gets to tell his friends his story but winter has been a very long time to remember. 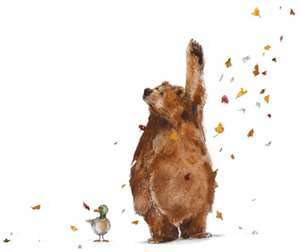 Bear Has a story to Tell has some wonderful clear messages for children that are built around lovable characters. Beautifully presented this book impresses all round and is a delight to share with little ones. Regardless of the age children will fall in love with Bear and his friends. The illustrations encourage discussion and language in even the youngest child with plenty of opportunity to point and label or to learn about hibernation and animal life. Bear Has a Story to Tell by Philip C. Stead, illustrations by Erin E. Stead will soon become a welcome part of a child's 'read it again' library.